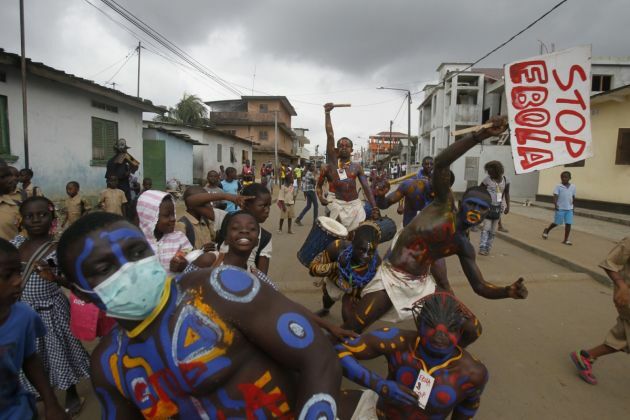 (Photo: REUTERS / Luc Gnago)Actors parade on a street after performing at Anono school, during an awareness campaign against Ebola in Abidjan, Cote D'Ivoire September 25, 2014. GENEVA - Faith-based organizations and churches are essential for an effective response to the Ebola crisis in Western Africa, United Nations diplomats and aid workers in Geneva have heard. "Ebola - Socio-economic and Human Rights Implications" was the topic discussed at a side event September 22 at the 27th session of the United Nations Human Rights Council in the Swiss city. "This is an outbreak we have never seen before" Dr. Eric Bertherat of the WHO said. The containment strategy includes identifying all people who have had contact with the infected person and taking care of the sick and the dead, so he stressed the need to engage people through local leaders. "In many places, people do not trust science, technical or medical explanations," he said. "But they will trust religious leaders. "They are trusted and command respect," Bertherat explained. Yvette Stevens, Sierra Leone Ambassador, said "Ebola is no longer just a public health crisis." She said, "If we do not contain it, entire communities will be wiped out." The event at the UN was organized by the Lutheran World Federation, ACT Alliance and the World Council of Churches as well as ambassadors from the Ebola-affected countries of Sierra Leone and Guinea attended. Also present were representatives of the World Health Organization and faith-based non-governmental organizations such as the LWF and the WCC, the Lutheran World Federation said in a statement. Stigma and mass isolation have caused socioeconomic ruptures in the countries of Liberia, Sierra Leone and Guinea where the epidemic has struck the most. "All existing health facilities are closed or dealing solely with Ebola," Ambassador Stevens noted. Aboubacar Cissé, the Guinea representative said, "The poor population is totally powerless .... We have to act quickly". Churches and faith-based organizations are a vital part of that response, as they run many of the health facilities in the affected areas. The Lutheran Church in Liberia also has a diaconal arm which has extensive experience in awareness raising and trauma counseling on HIV/AIDS. LWF Secretary for Africa Rev. Elieshi Mungure has highlighted the effective emergency response by churches in Liberia, where LWF staff conducted an emergency response and disaster risk management training in 2013. "They have worked through their overstretched health care facilities, and the local communities have gathered other resources to offer support to the affected communities", Rev. Mungure explained. "For example, the government built an isolation center while the church built a transit or reception center". As the containment strategy includes identifying all people who have had contact with the infected person and taking care of the sick and the dead, he stressed the need to engage people through local leaders. The WHO's Bertherat sees faith groups as crucial in the implementation of the necessary precautions. "We absolutely need more faith-based involvement for the management of cases and the tracking of contacts," he said. This would be especially important in advocating for safe funerals, as the necessary precautions to avoid further infection caused fear and apprehension among the local populations. The manner in which some West African funerals are conducted has been pinpointed as spreading the disease. "The protocols in treating and burying of the deceased are traumatic," Rev. Mungure said. "Africans have elaborated rituals for burying and mourning, which cannot be practiced. "This is adding to the pain and possible denial, which may make people keep their sick ones with them as much as they can." Churches are also asked to help reduce stigma and rumors about witchcraft, which in some areas are believed to be the cause of the disease. These have severe social and medical consequences, as people turn to traditional healing methods which might cause even more infections. "Churches are rooted in the communities they serve, they have structures and effective communication channels on the ground and they know how to mobilize people," Dr. Sue Parry, consultant for the WCC' health and healing, said. "Religious leaders know how to mobilize people, they are trusted and they command a lot of respect."